A sensory-friendly Santa portrait experience for children with special needs. No more waiting in lines! We strive to keep the cost to families low and capture a high quality portrait, while providing a positive and calm experience for our families. Your child will meet Santa in a supported environment at their own designated time. In 2011, we added online booking and payment, and a second event day - one in November and one in December for our Tacoma location. Between 2016 and 2017, we were able to add additional locations and new volunteer teams in Puyallup and Olympia! Registration is open for our 2018 Sensational Santa season! We hope to see you this holiday season! Keep in touch with us by visiting our Facebook page. Make sure you "Like" us! Our experience was wonderful! Our little boy loved Santa's sled and he was very excited to see Santa again and have his picture taken. Everyone was friendly and organized. Loved it! He was the best Santa ever!!! I must say I was really impressed with the Santa and the photographer and Angela who was such a kind woman and helped my daughter stop running around and calm down due to her sensory disorder. I loved how you all knew so much about sensory issues, such as the lights were dimmed enough to keep her calmer than usual and how the Santa worked his way up by touching her finger to finger first so she wasn't so scared. You all were all so wonderful! I was so impressed with the photo, it was by far the best pic I have ever had taken with Santa. Thank you all! Awesome! It was so nice to take my son and not have screaming because of lines and crowds. They had things for the kids to do while getting ready for the picture. A very easy process and would totally recommend it to any family with special children!!! Personal, Magical, Personalized and Remarkable! Our kids haven't gotten to do the whole Santa thing due to the stress the event created for them. Sensational Santa is a royal treat; complete with peace, quiet, understanding, and a beautiful, affordable photo experience for us ALL. My kids were as calm as they could be, and therefore so were we -- as parents. THANK YOU! Look forward to next year's appointment! A very special memory. 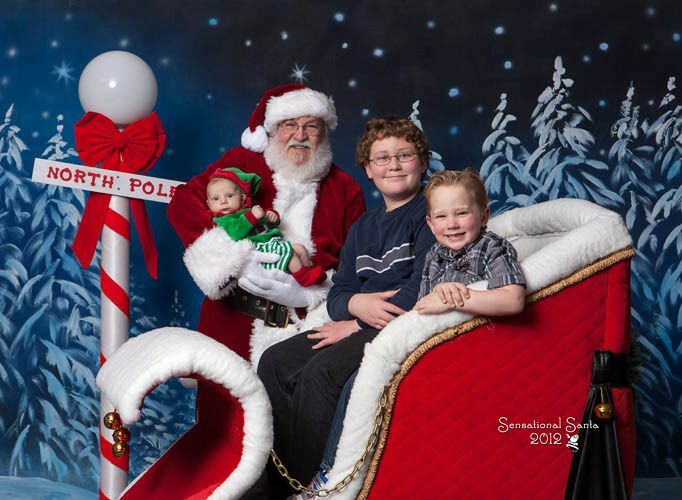 Thank you so much for giving our two boys the wonderful opportunity to visit Santa in a welcoming, intuitive (to their needs), and happy environment. You have provided our family with a precious new way to celebrate a long desired holiday tradition. We have great hopes of returning next year!